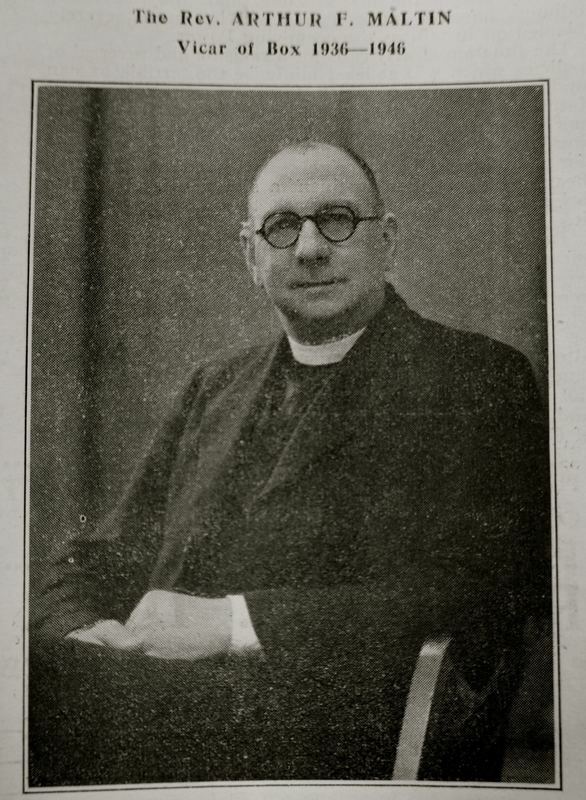 Rev Arthur Frank Maltin (photographed right, courtesy Box Parish Magazine) was vicar of Box throughout the Second World War from 1936 until 1946 when he left to take up a ministry in London. Of course, there were worse places during the wartime but Arthur Maltin had seen service during the First World War and his own children entered the RAF during the Second. His notes from the Parish Magazine enlighten events in the village throughout the war years. He was dependable, consistent and undemonstrative, the ideal person to hold the village together in times of need. 1935 May King’s Silver Jubilee Fund at The Northey Arms attended by 500 people. 1940 Air Ministry bought Rudloe Manor as HQ of 10 Group Fighter Command. 1940 September Aircraft production planned for underground factories in the Box and Corsham stone mines. 1940 Lights installed at Norbin Barton Farm to replicate Thingley Railway Junction electricity generator to simulate fires of bomb strikes.